Commemorating the 200th Birthday of Queen Victoria and Prince Albert. Click on the link below for a bigger color photograph. This smiling, golden brown mohair Birthday Bear comes in a very nice golden gift box with a cushion. On one paw pad a gold heart is embroidered with "Royal Birthday Jubilee" and the Edition number of the bear, embroidered in red. On the other pawpad, two gold hearts intertwined are embroidered in gold, with the words "Albert" and "Victoria", together with the date 1819-2019 embroidered in red. Around his neck, a deep red bow has an elaborate gold crown embroidered in the center, circled with gold thread, and decorated with SWAROVSKI Crystal Elements. 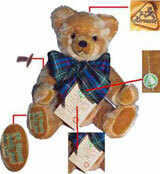 Mohair teddy bear, with traditional excelsior filling,. Growler voice. 34cm 13,75 inch.